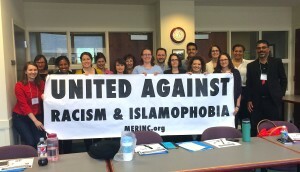 Manzoor Cheema from Movement to End Racism and Islamophobia made two presentations titled “Challenging Racism and Islamophobia” at the University of North Carolina at Chapel Hill School of Social Work on May 20, 2016. These presentations were part of Field Instructors’ and Task Supervisors’ Appreciation Conference. These presentations explored the roots of Islamophobia; how it impacts Muslim students, patients, workers, immigrants and general community members; and tools social workers could use when dealign with Muslim clients. Founded in 1920, the UNC School of Social Work is consistently ranked as one of the best in the nation. Through innovative research that improves practice and enhances education, we search for solutions to the challenges of poverty, mental health, violence, and substance abuse. We prepare social workers to make a difference. We are a graduate school offering M.S.W. and Ph.D. degrees. Our School has a tradition of excellence in producing practitioners and leaders who are committed to public, private and nonprofit services and to the development of policies and programs that strengthen individuals, families, groups, communities and organizations. Across the country and internationally, alumni serve in a variety of direct practice and management positions. Our graduates work with racially diverse communities in rural, urban and suburban settings. They assist children and the elderly and those who are ill or challenged by mental and physical disabilities. Our graduates build on the strengths inherent in at-risk populations and bring compassion and wisdom to the most intransigent social problems. Our faculty members are respected and recognized scholars and entrepreneurs who have produced a wide range of innovative research, including studies that address some of the most pressing problems of addiction, aging, at-risk youth, poverty, healthcare, family violence and affordable housing. The School has grown to include 27 tenured and tenure-track faculty members – seven of whom are chaired or distinguished professors – and more than 65 clinical and research faculty members. In 2011, social work faculty received more than $12 million in grant funding.